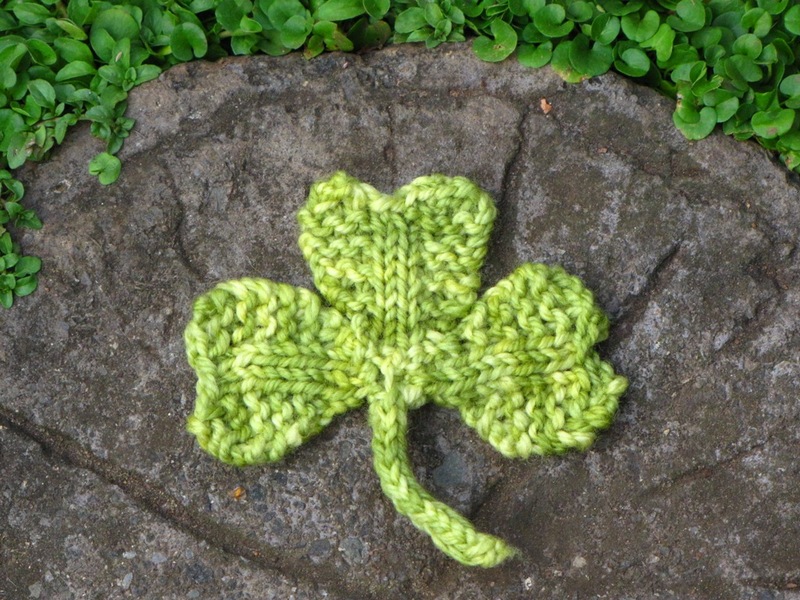 We celebrate St Patrick’s day here because of our Irish ancestry and I thought a knitted Shamrock would be a fun and enjoyable knit for today, I am so happy to share it with you here.You could make it into a hanging ornament, sew it onto a scarf or on the side of a hat or even a sweater. It looks pretty sweet as a brooch too. Needle for sewing up your Shamrock and ends. 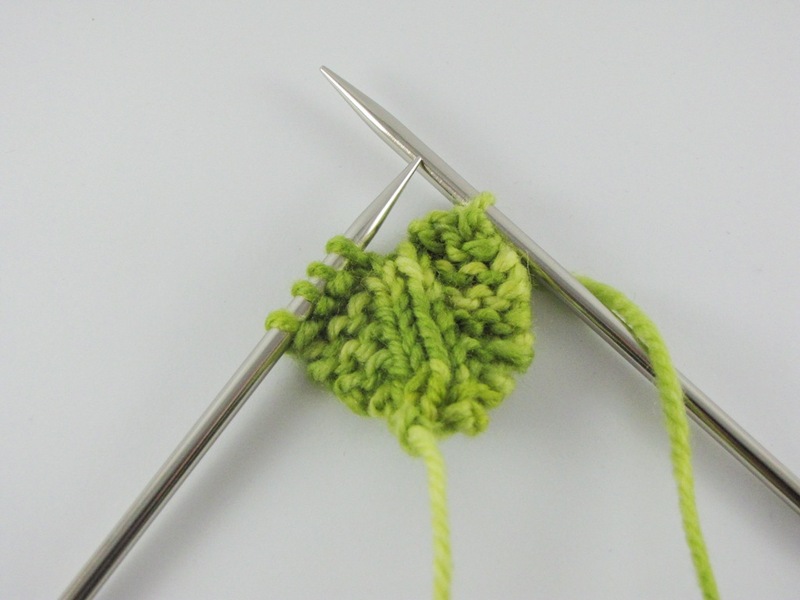 2 Double pointed needles for knitting the i-cord for the stem. Row 4: Knit 1 stitch, purl 2 stitches, knit 1 stitch. Row 6: Knit 2 stitches, purl 2 stitches, knit 2 stitches. Row 8: Knit 3 stitches, purl 2 stitches, knit 3 stitches. Row 10: Knit 3 stitches, purl 2 stitches, knit 3 stitches. Row 12: Knit 3 stitches, purl 2 stitches, knit 3 stitches. Row 13: Knit 4 stitches, turn work. Row 14: Knit 4 stitches, turn work. One stitch left on the right needle. Picking up the 3 stitches. with the single stitch on the right needle. needle over the stitch before it. One stitch remains on the right needle. Knit 3 stitches from the left needle to the right needle, turn work. the back stitch over the front stitch. Sew in the top ends of the Shamrock pieces, leaving the ends at the base for sewing your Shamrock together. 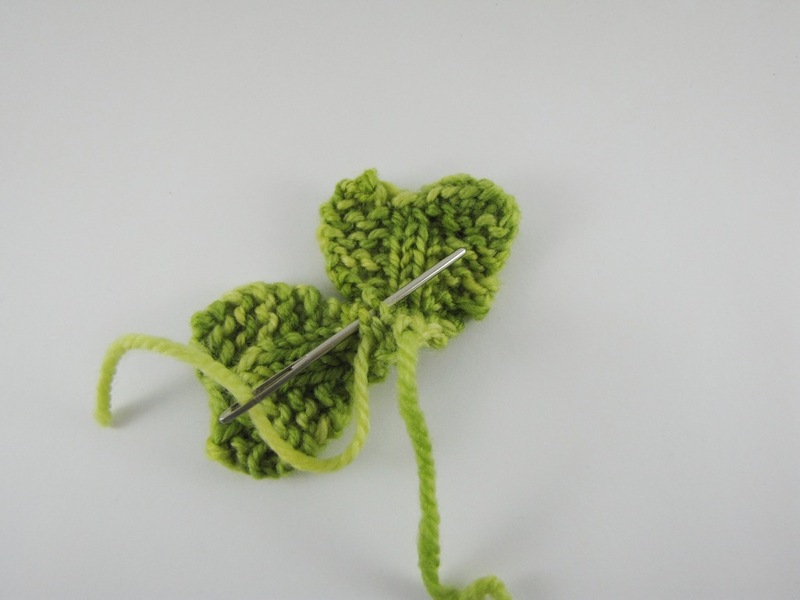 Pick up 3 stitches at the base of the Shamrock with a double pointed needle. Knit an i-cord for 3 inches and then cast off. Very cute, Linda! I finished my suffolk sheep if you want to see…. I had to make felt ears…hope that was OK. I am 1/4 Irish and since my blog’s name is Clover I can’t wait to cast this on! You have out done yourself this time dear Linda, thank you! Thank you so much for sharing this pattern! In perfect timing because I was wanting to knit some shamrocks this year but the pattern I had was much more complicated and the result not nearly as nice as yours! Now I am very excited to give your pattern a try! Love this and can’t wait to try it, thanks! Your shamrock is adorable! Thanks for sharing the pattern. Your Shamrock is awesome. I have been thinking I needed to practice my knitting and this would be a perfect little project for one of my favorite holidays. Thanks for sharing the pattern! I can’t wait to try one! 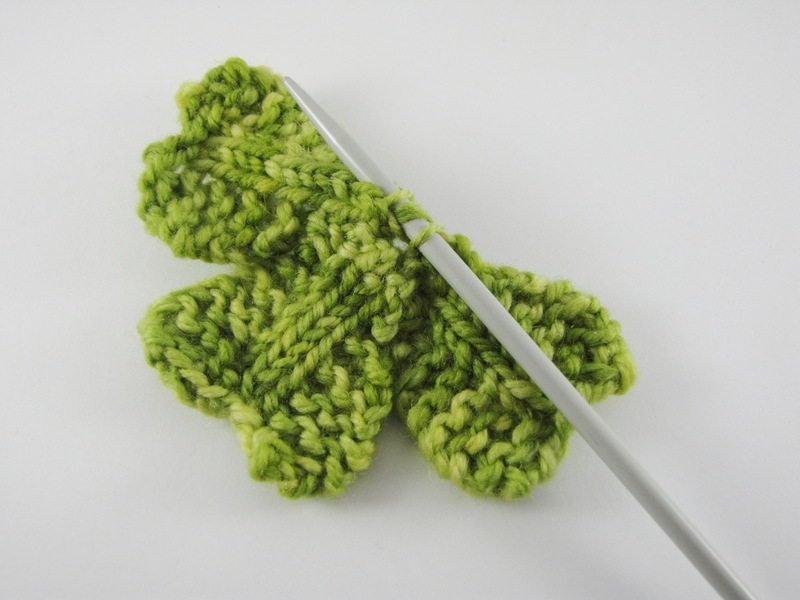 You’ve chosen just the right colour yarn for the shamrock. It looks very effective. Such a lovely pattern, thank you for sharing! Oh,oh,oh – I want to do this. I’d learn from it. Now I just have to settle down and actually try. Have I mentioned lately that I LOVE you? The green color of this bitty thing has so refreshed my eyes today. I’ll try to find something to do it with, then show you. Right now, I’m exhausted making camel legs. Very cute! Thank you for the pattern! oh so cute! you are so sweet to share the pattern, thank you linda. oooh, I have some scrap green yarn this would be perfect for. thank you for sharing the pattern. A gorgeous pattern as always from you. You are incredible! 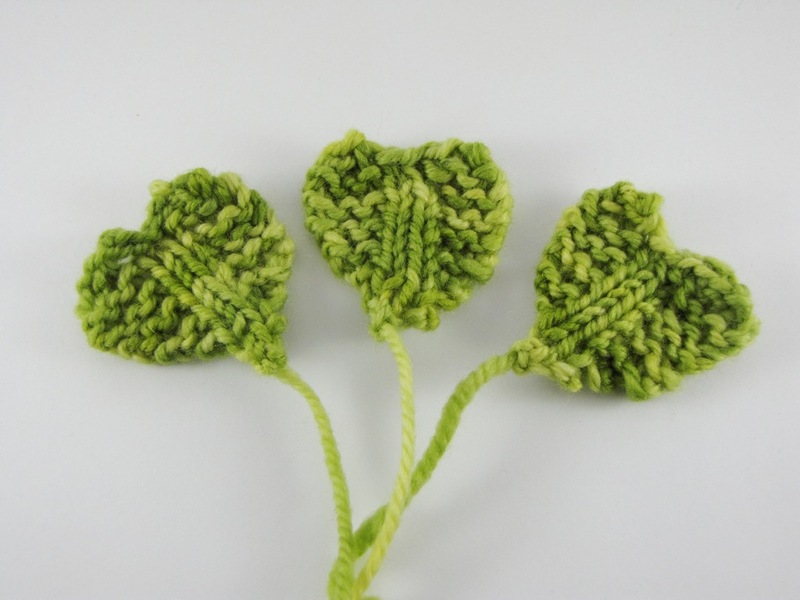 I must knit at least one of these little clovers for St Patrick’s Day. Thank you for sharing with us all. And thank you for linking up at Spinspiration. Hope you are all well and wishing you a very happy weekend! This is really fantastic! I love it. Lovely! My mom could spend hours looking for 4-leaf clovers — perhaps I can add a clove to your creative design. Although, the daughter of a bowling friend met and married and moved to Ireland. Oh, I also have a few pieces of Irish Belleek china! Corned beef and cabbage with potato – a fav of mine. Hey I need help with picking up the 3 stitches. Which needle do you use – left or right? Do you pick them up from the right hand side like next to the one stitch on the right hand needle or underneath the 4 stitches on the left hand needle? am i the only person that does not understand these directions??? after knit 4 stitches turn knit 4 stitches i am completely lost i have tried five of these and cannot get it right. I am having the same problem. I am trying to use youtube to help. 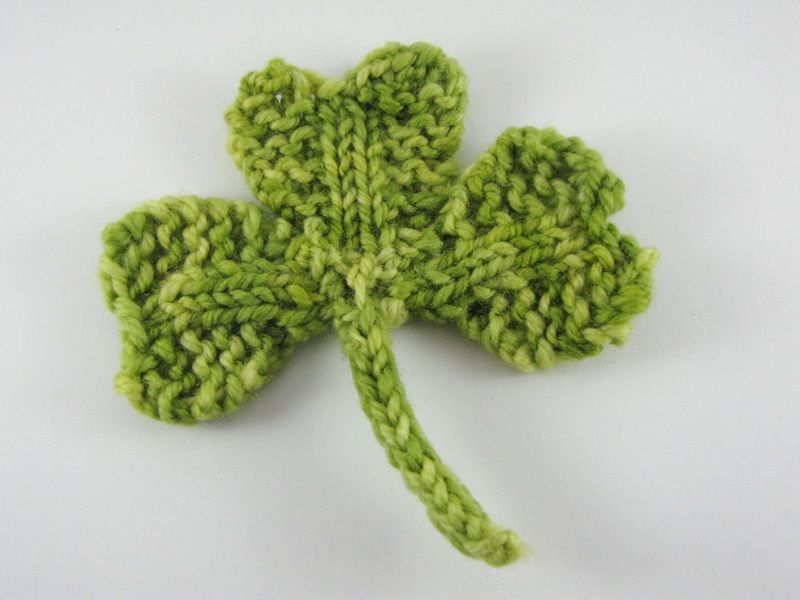 I figured out how to turn the work but can’t seem to find how to “pick up 3 stitches up the left side of the top of the shamrock with the left needle and cast them off” and pretty much the rest of the pattern has me stuck. I am a very visual learner – do you have a youtube channel or video to share? Thank you! Hello from NH,USA! Thanks for this cute pattern I can’t wait to try it, I am new to knitting so I get excited over new designs. Welcome Erika!! Hello from South Africa:) You are most welcome about the pattern. Oh Linda I am so lost 🙁 I have tried to get help from 2 other knitters & they are stumped as well.. “Pick up 3 stitiches up the left side of the top of the shamrock with the left needle & cast them off w/stitich on the R needle” How do you pick up the stitches when they are already on the left needle? Also I am confused about knit 4 stitches and turn work, then knit 4. 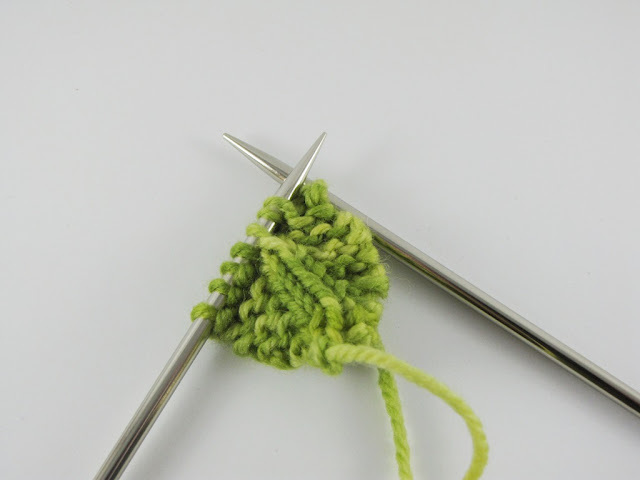 When you turn the work to knit another 4 stitches the working thread is on the left needle-do you just bring the thread to the back of the work to continue kn itting? I am having the same problem. I found how to turn work on youtube (it’s so simple) but the rest of the pattern, I can’t finish because the pick up stitches with the needle they are on…I am stumped and can’t seem to find a youtube video to help. I can’t figure out what she did from the picture either. I love the result and really want to complete this but need some help with the rest of the pattern. thank you! ok, so I figured out that cast off is the same as bind off 🙂 So that helps, except I am still wondering about the picking up of stitches. I watched some videos of that, but still struggling to understand how to do it for this particular pattern. Thanks for posting this cute pattern and (fantastic) tutorial! We just shared it on our Facebook page. I think you should post a video of how to stitch this pattern for th4 dummies like me who don’t get it 🙁 I bought 2 yarns to make this pattern & no one can help me with this pattern, I’m so bummed! Thank you for this lovely shamrock pattern, I have just made my first one tonight and hope to make several more, for friends, before St Patricks Day. I just knit for of these and appliquéd them to the top of a white baby hat for a friend who is due on St. Patrick’s Day- it came out so cute! Thank you for posting this! It seems as if lately every time I look for a seasonal pattern I wind up picking one by you. Thanks for all your gorgeous, detailed patterns. I want to make one (several?) but do not know how to knit a cord using three strands of yarn. Help! Hi Jo-Ann, if you Google i-cord you will find quite a few tutorials online. Thanks so much for the pattern Linda. 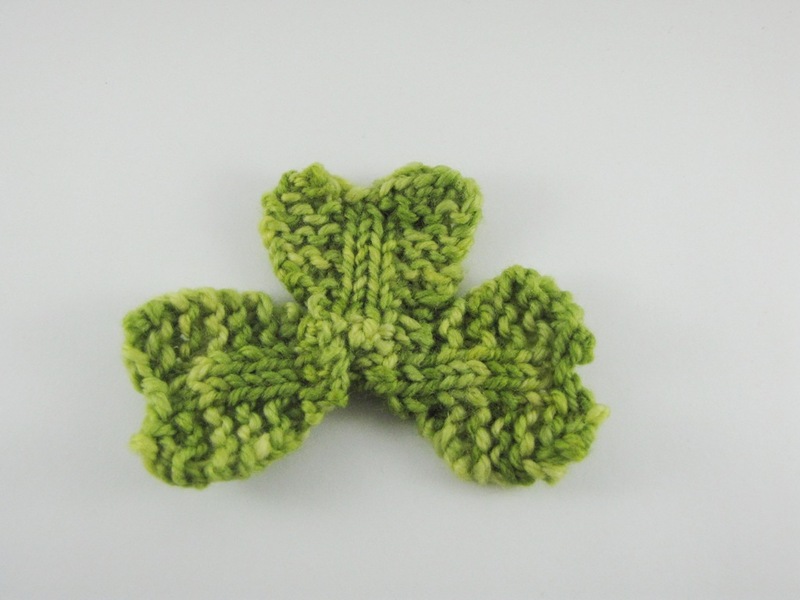 I have been planning on knitting a green doggy sweater for my daughter’s puppy and had been looking for a shamrock pattern to adorn it. I will print your pattern for the day I actually get around to it. Hopefully this year!